The past 10 years have seen a growth of therapeutic options for bipolar depression. 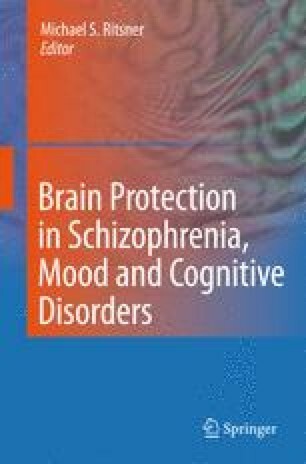 Evidence for the clinical and neuroprotective effects of these treatments is reviewed in this chapter, including lamotrigine, pramipexole, modafinil, and atypical antipsychotics. Their neuroprotective profiles are compared to the better established effects of lithium and valproate, which include upregulation of brain-derived neurotrophic factor (BDNF) and B-cell lymphoma 2 (bcl-2) and inhibition of glycogen synthase kinase-3β (GSK-3β) and glutamate transmission. The neuroprotective profile of antidepressants will also be examined to better understand their controversial role in bipolar depression. Treatments with efficacy in multiple phases of bipolar illness exert neuroprotective effects in multiple brain regions, including the anterior cingulate cortex, striatum, and hippocampus. Antidepressants, in contrast, have a more focal neuroprotective effect through BDNF in the hippocampus. Finally, this chapter will explore both the clinical and neuroprotective effects of adjunctive and complimentary treatments for bipolar depression, including psychotherapy, omega-3 fatty acids, N-acetylcysteine, diet and exercise. Lastly, the neuroplasticity model will be explored as a tool for engaging patients in their recovery and improving medication adherence.